Seating will be limited. Tickets must be purchased in advance. 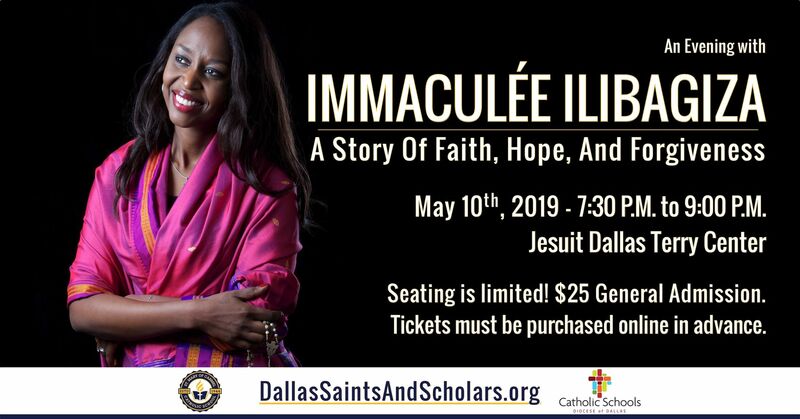 Proceeds will benefit Catholic Education in the Diocese of Dallas through St. Mary of Carmel Catholic School, a beacon of hope in West Dallas. Doors will open at 6:30 P.M. A Dessert Reception will follow immediately after the presentation. Due to the content of the talk, this event is not appropriate for young children. Visit DallasSaintsAndScholars.org for more information. Becoming a sponsor is the best way to obtain priority seating at the event. There are many benefits to becoming a sponsor at various levels, including a Meet & Greet Reception with Immaculée that will be limited to 40 attendees. All sponsors will be recognized on our website. Seating is limited! Consider becoming a Patron Sponsor if you wish to receive reserved seating. Become a Friend Sponsor by donating a General Admission Ticket on behalf of a Teacher from one of our Catholic Schools. Become a Friend Sponsor by donating a General Admission Ticket on behalf of a Student from one of our Catholic High Schools. Recognition at the event and on our website. St. Mary of Carmel Catholic School has partnered with Give Lively to securely process your online donation. This transaction will appear on your credit card statement as "St. Mary of Carmel Catholic School". This transaction is subject to Give Lively's Terms and Privacy.